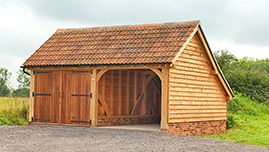 We are local specialists in building beautiful timber framed garages and outbuildings across the county of Worcestershire and its surrounding areas. We have a reputation for the quality and detail of our oak framed designs, which can be tailored to your needs, lending them to a multitude of uses such as; garaging, barn style outbuildings or living space. By using high quality craftsmanship and traditional oak timbers we are able to create the perfect addition to your property, designed to suit your exacting requirements. Our beams and posts are generously cut and our braces are hand crafted to add provenance to the build, resulting in a garage building admired for its style, perfectly in keeping with the surrounding Worcestershire countryside. Whether you’re looking for the ideal place to store your classic car or wanting to create extra space for your guests, our highly skilled craftsmen are the perfect people to build your detailed, functional, oak framed garage or barn complex. Our craftsmanship is something we are extremely proud of and our membership of The Guild of Master Craftsman demonstrates our commitment to upholding the highest level of skill and workmanship. We can support you throughout the build process including; working with you to produce the perfect design for your needs, helping you to understand Worcester’s local planning regulations and taking care of your planning application if required. 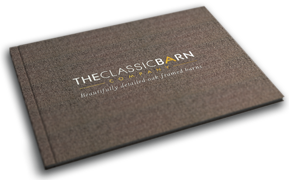 We will be there every step of the way starting with an on site consultation right through to the completion of your new classic barn. We would encourage you to take a look for yourself at our beautiful oak framed buildings, either in person or by watching our video and compare them to anywhere in the marketplace. Our timber barns and garages offer a fantastic investment that will add value to your property and give you the perfect extra space you’re looking for. If you’d like a no obligation quote for your project, please contact us to receive our brochure and we’ll be in touch to discuss your requirements. Commissioning projects in Evesham, Worcester, Malvern, Tenbury Wells, Pershore, Upton on Severn, Kempsey, Wichenford, Abberley, Hallow, Ashton under Hill, Kidderminster, Martley and Welland.